Welcome to Omnibus-MI.us, the home of The Phase Place. Construction on this website began on January 26, 2013. Our first blog posting was June 7, 2013 and we have been trying to post regularly since then. Our H3-40 with new paint! August 2012. Pictured above is our motorhome. It’s a 1991 MY Prevost H3-40 VIP motorcoach that left the Prevost factory in August 1990 and went directly to Royale Coach (Monaco) Inc. in Elkhart, Indiana to be converted into a motorhome. Royale Coach finished the conversion in October 1991 and titled it as a 1992. 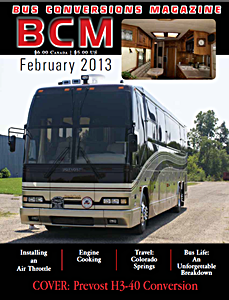 It’s shown here with its new paint job from Phoenix Paint in Edwardsburg, MI, as featured in the February 2013 issue of Bus Conversions Magazine (see our BCM page under the RV/Travel tab for more information and special savings on a subscription.) We are in the process of redoing many of its systems and plan to post blog entries and photos here about that work. We also plan to post blog entries and photos about our travels in this converted coach. Our other interests include amateur (ham) radio, photography, and a whole-food plant-based way of eating, along with our home, family, and friends. Blog entries are categorized by one or more of those things. To subscribe, go to the BCM store. To see the covers of the issues in which Bruce has had articles published, and a brief description of each one, please go to our BCM page under RV/Travel. 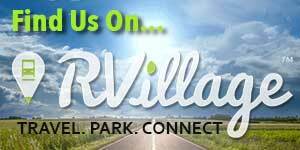 We are also big fans of RVillage, which we consider to be “our village”.